(Nanowerk News) All inorganic cesium lead halide perovskite semiconductors exhibit great potential for nanolasers, light emitting diodes and solar cells due to their unique properties including low threshold, high quantum efficiency and low cost. However, the high material refractive index of perovskite semiconductors hinders light extraction efficiency for photonic and illumination applications. Very recently, an NTU team lead by Assoc. Prof. Wang Hong, demonstrated high light extraction efficiency of perovskite photonic crystals fabricated by delicate electron-beam lithography (ACS Photonics, "Concurrent Inhibition and Redistribution of Spontaneous Emission from All Inorganic Perovskite Photonic Crystals"). 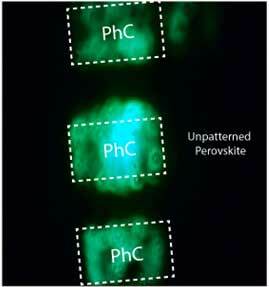 The perovskite photonic crystals exhibit both emission rate inhibition and light energy redistribution simultaneously. They observed 7.9-fold reduction of spontaneous emission rate with a slower decay in perovskite photonic crystals due to photonic bandgap effect (PBG). 23.5-fold emission intensity enhancement were also clearly observed as results of light energy redistribution from 2D guided modes to vertical direction in perovskite photonic crystals thin films, indicating a high intrinsic light extraction efficiency. This observation is the second largest extraction efficiency with two-dimensional photonic crystals in comparison with that of 500 folds in Silicon. Although there is an emission inhibition, but since the light is improved by the direction coupling, the emission image in the figure above shows a significant brightness in photonic crystals comparing with that in unpatterned films. Such combination of inhibiting undesirable emission with redistributing light energy into useful modes offers a new promising approach in various applications for perovskite, including solar cell, displays and photovoltaics.